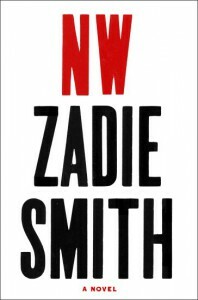 Zadie Smith expects a lot from NW, her fourth novel. She wants it to reinvent her readership’s image of her even as it re-establishes her literary roots, and to revive the energy of her chosen form — the novel — even as it tries to revise the novel’s parameters. NW purports to follow the lives of four Northwest Londoners, but the stories of childhood best friends Leah and Keisha (who changes her name to Natalie), both of whom grew up in a projects-style council estate, receive the bulk of the novel’s space, depth, and energy. The first and most experimental section focuses on Leah Hanwell, a white half-Irish Londoner who is married, in typical Zadie Smith fashion, to a black French immigrant whose name (Michel) and lofty ambitions are subject, or so it seems to Leah, to constant butchering by everyone else. Unlike her husband, Leah lacks both lofty ambitions and the desire for children. Her goal, bluntly stated in the novel’s early pages, is to remain in blissful newlywed stasis for eternity. On the other hand, Natalie (for that is her name when the story picks up) cannot bear stasis as it permits too much time for the terrifying activity of self-reflection. The daughter of Caribbean immigrants, she like Leah is married to a European man whose dark skin color belies his background. The drama of NW occurs mostly in exploring the anxious, identity-crisis-prone inner lives of Leah and Natalie. Emphasis on interiority is necessary because the characters’ external lives — growing up, going to school, loving and hating university, getting married — are not noteworthy in an obvious way. NW is concerned less with what will become of Leah and Natalie than how and why they became. Smith did well to avoid scenes of extraneous extraordinary action in NW, as such scenes tended only to destroy her earlier novels’ illusion of reality without offering anything more interesting. The move — away from plot, towards interiority — indicates a change in the type of novel Smith wants to write. In her 2008 essay “Two Paths for the Novel,” which appeared in The New York Review of Books three years after the publication of her third novel On Beauty, Smith contrasts a contemporary Realist novel (Joseph O’Neill’s Netherland) with a more avant-garde example of the form (Tom McCarthy’s Remainder). Smith clearly preferred the latter novel; at that point, though, her own published fiction read more like the former. NW comes across as Smith’s effort to break away from the comfortable Realist mold that has brought her fame and acclaim. In “Two Paths,” she observes “most avant-garde challenges to Realism concentrate on voice, on where this ‘I’ is coming from, this mysterious third person.” It is impossible not to measure this observation against the first section of NW, which conspicuously lacks the warm, knowledgeable, and somewhat distant narrative voice on which Smith has built much of her literary career. In the narrator’s place, Smith builds the section out of short sentences, incomplete sentences, sentences without periods that break mid-line. It still uses a third-person narrator, but hews so closely to its subject, Leah Hanwell, that any sense of the narrator’s identity is obscured. This style — Zadie Smith gone Modernist — usually works well enough. But it’s not what makes NW the best novel Smith has written to date. I heard Zadie Smith speak in New York about a year and a half ago. Asked about her dramatic early success as a novelist, Smith essentially said she was grateful that so many people liked her books, but that she occasionally envied her less-famous writer friends whose readings were attended by small but highly-devoted clusters of hipsters. She said she asked herself “Where are my hipsters?” NW strikes me as Smith’s attempt to find those “hipsters,” in part by focusing almost exclusively on characters in their thirties where previous novels dipped into the minds of many generations, and in part by using slightly unconventional (though not groundbreaking) style as her tool. To use inexcusably reductive Creative Writing terms, you might say that White Teeth, with its long narratorial sentences describing multicultural London in broad terms, is a novel that “tells,” while NW, which engages a similar subject via close-up consciousness dredging presented in several forms, is a novel that “shows.” But a few line breaks, meta comments, and short sections certainly won’t deter the heterogeneous literary hordes from reading and adoring Smith’s latest London novel.